These are usually a late summer treat for us, when the rainbow color of fresh, ripe peppers (bell peppers, cubanelles, pablanos... just about any kind of mild one you can dream up) is finally ready for harvesting. But, we do still enjoy fajitas after the garden is put to sleep when my freezer contains the preserved abundance. 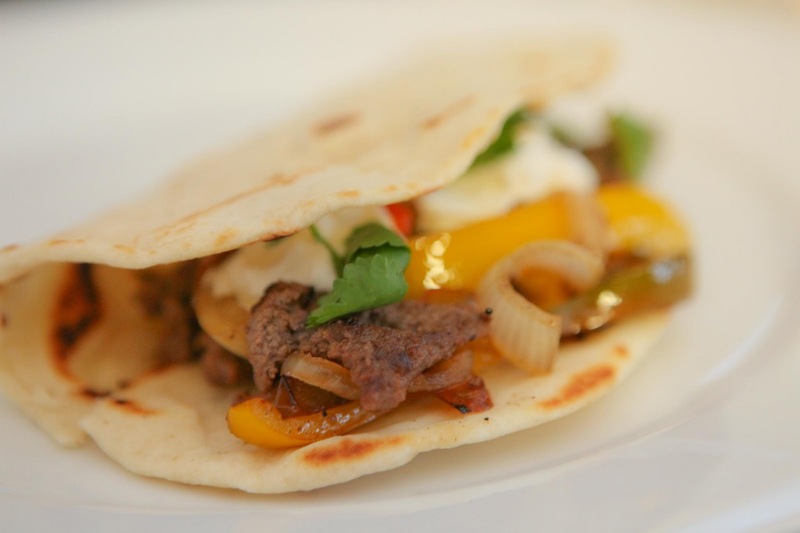 This recipe is for steak fajitas, but an all-vegetarian option is equally (dare I say, perhaps even more) delicious! ~note: taste the marinade before adding the meat, as you may prefer to add more sugar to sweeten it or fish sauce for more saltiness. 1. Slice the steak into strips and add to the marinade. You can either allow the meat to marinate for 30 minutes, or use it straightaway. Because the lime juice begins to "cook" the meat, this is not a marinade you want sitting for hours, or the meat may become tough. 5. Enjoy with warm homemade flour tortillas. We also like to top ours with sour cream, cilantro, and salsa. (And guacamole when we're lucky). Yum. I'm going to make this tomorrow! Thanks for the inspiration. oh my goodness...what a pic! i love making these with steak too although sometimes we just do with lots of beans and vegies and they are nice too. Yet to try your tortilla recipe so another good idea for me to use them with! Will try your marinade...looks yummy, thanks for sharing Jaime.